Yes, here's another recently acquired US pocket watch. 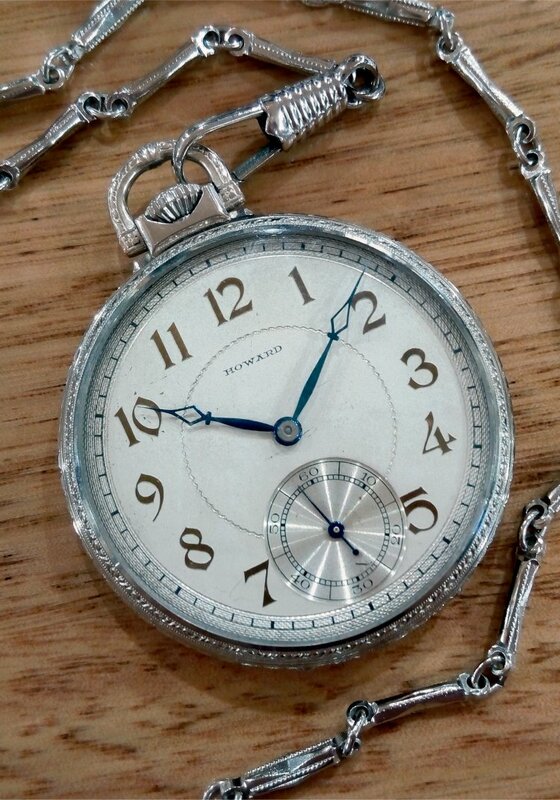 This is an early-1920s Howard Series 7, 12 size watch. Over the past year or so I've been exploring US brands I've had little or no experience with to date and this is one of them. In 1902 the Keystone Watch Case Co. obtained the rights to use the Howard name, which had formerly been a producer of high quality watches. Keystone produced their own design watches from around 1905 up to 1930. These watches are marked "E. Howard Watch Co. Boston USA" and referred to as Keystone-Howards to differentiate them from the earlier Howard watches. For many years during my collecting I had gained the impression that the Keystone-Howards were looked down on a bit, in comparison to the "original" Howard product. However, in looking at many examples in photos they certainly looked very good to me. There's something about quality US movements that stands out, and the movements in these watches had all the traits of precise manufacturing quality and fine finishing. Was there really something wrong with them? One way to find out - get some! :-) I was particularly attracted to the 12 size movements with their bridge design layout. They just looked so good. In a short period I acquired two examples of the watches, one 17 jeweler and one 19 jeweler. 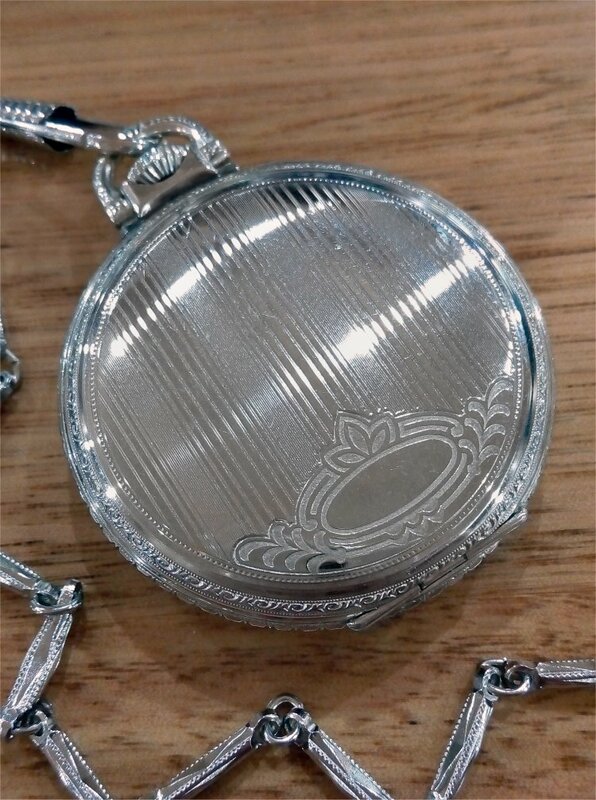 This is the 17 jewel watch, which has a nice metal dial in good condition and a great fancy embossed case. Whilst these movements are nominally 12 size the mainplates take a 14 size dial. The larger dial lends the watch a somewhat bigger look. 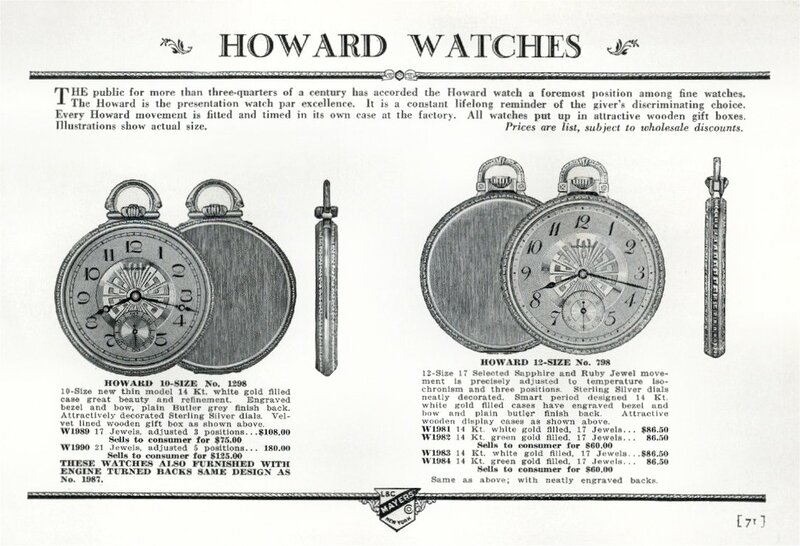 This page from a 1930 Howard catalogue shows a 12 size watch at the right with a very similar case to that on my watch. After sending the watch off for service with Rob B the verdict was that these Howards are indeed high quality movements, being very well made and finished. A noteable technical aspect Rob found different to comparable US makes was that the Howard movements had fixed banking pins, rather than the adjustable pins found on other brands. Not so much a lack rather than adjustable pins being more convenient to work with. Below you can see on the left a seller's pic of the movement in the watch as it was when sold. I have pointed out an issue that was obvious - the regulator spring was missing. This flat steel spring provides tension to the regulator arm. It's not uncommon for such springs to break from fatigue or poor handling. Thus I knew beforehand that I would need to find a replacement spring. There's two ways to obtain parts - buy them separately or get them off a parts movement/watch. It can be just as difficult or pricey to find either way and in this case I opted to get a spare parts movement as shown in the seller's pic at the right. This is another Howard 12 size movement that has, literally, been wrenched out of its case. You can see at the bottom where pliers were used to lever the case ring out. Rough as guts, but it appeared the movement had survived. Importantly, this movement had its regulator spring intact (as pointed out) which could be used on my watch. It's a good thing I got the parts movement as it came in very handy as a donor for various other parts needed for both this watch and the other Howard I acquired. Below you can see the Series 7 17 jewel movement after servicing. A really nice little movement. It did put up a bit of a fight, though, with Rob needing to do quite a bit of work to get it running well. The regulator adjusting screw was broken off in its stud, perhaps allied to why the spring was missing. This needed to be replaced from the spare movement along with the regulator spring. One of the top capstone screws was broken - replaced from the spare movement. When cleaned and lubricated the movement was running around 10 minutes fast. 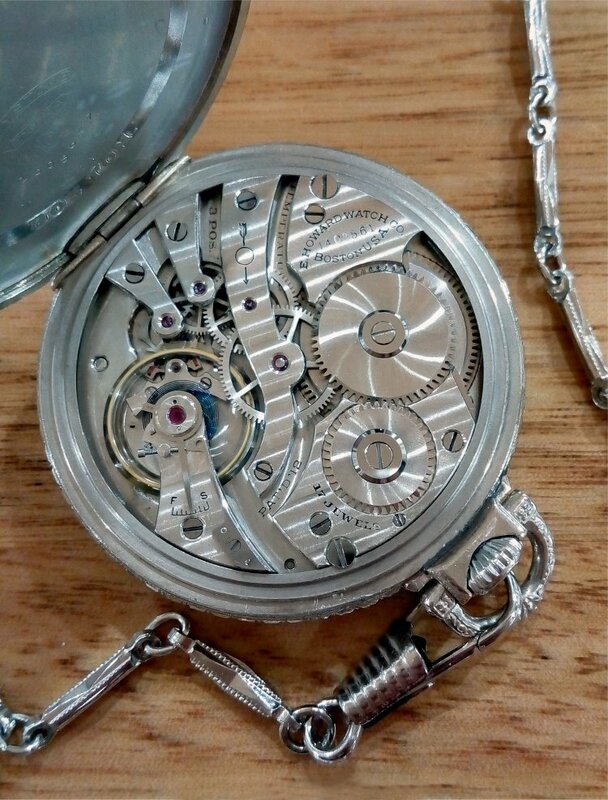 The hairspring was bent and the movement couldn't be timed with the issues it had. It appeared someone in the past had changed two of the balance timing screws in an attempt to regulate it. After straightening the hairspring Rob added timing washers to the balance to bring it back into time. Also, the canon pinion was cracked and again the spare movement came to the rescue. The hole in the minute hand needed to be shrunk to fit the new canon pinion. 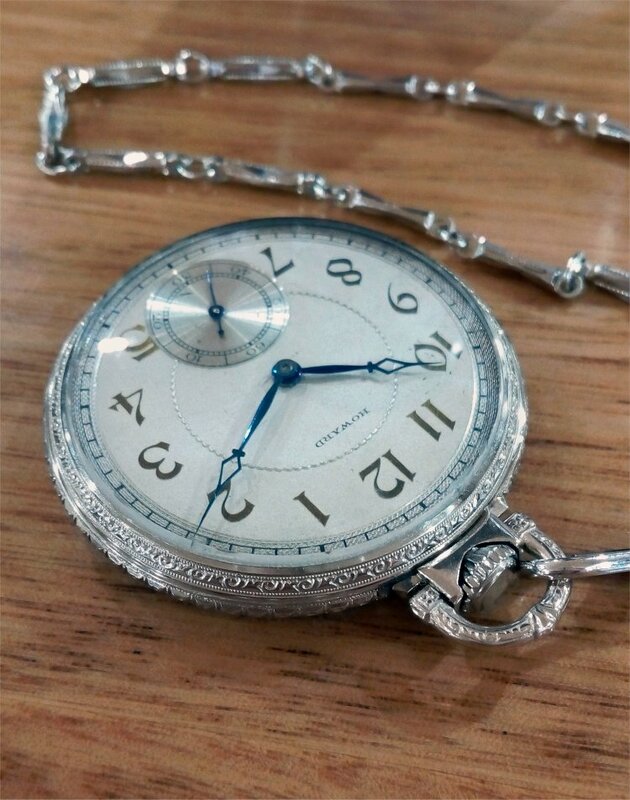 Otherwise, though, the movement was in good condition :-) The watch had been described in the auction as running but you really have to take sellers descriptions with a gain of salt. "Running" may only mean the balance is possibly OK, and maybe not even that as pivots can be bent, jewels cracked, etc. It's the luck of the draw to degree, depending on what depredations have occurred in the past. Ahhh,...the joys of vintage watch collecting :-) Nevertheless, it's great when it's all rectified and you get such a nice watch. The fancy embossed case is a Howard-marked "Extra" gold-filled model made, appropriately enough, by the Keystone Watch Case Co. The "Extra" models apparently had thicker gold layers than 25 year gold fill cases. It measures 46.9mm in dameter and 7.2mm thick. 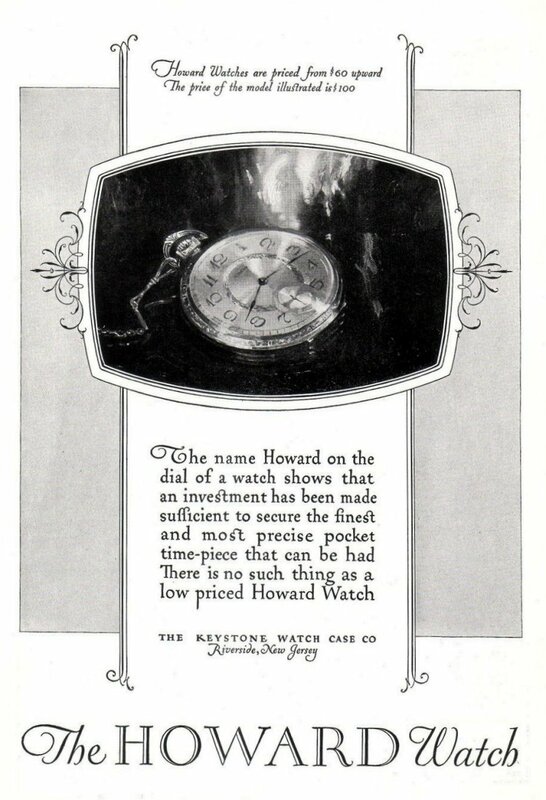 I like the last line in this 1926 Howard ad, "There is no such thing as a low priced Howard Watch" :-) Certainly, my first taste of the Keystone-Howards has been good and I'll be looking to acquire some more of the various sizes and models.